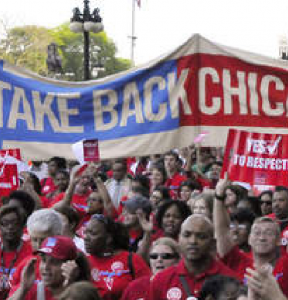 1PM Sat., 2/9: Rally with CICS strikers, CTU HQ, 1901 W. Carroll. Please RSVP @ chrisgeovanis@ctulocal1 so we can reserve space for cameras and reporters. CTU continues to reject management demand to trade raises for cuts to student services, as CICS continues to balk at releasing hoarded funds. CHICAGO—Striking CTU teachers and paraprofessionals at four CICS schools will rally at 1PM on Saturday at CTU HQ with elected officials, labor leaders and community activists, as strikers ready for a second week on the picket lines. Los Angeles charter teachers struck for almost two weeks last month, in conjunction with a massive strike by public school teachers in the city. In Chicago, striking CTU members at CICS have vowed to go as long as it takes to win educational justice for students. While there’s been some progress at the bargaining table, management is still insisting on trading pay raises for low-wage workers, some of whom make less than $30,000/year, for concessions that would set the table for growing class sizes, cuts to counselors and under-resourcing student programs. Strikers have balked at trading a pay raise of any size for cuts to classroom resources, layoffs or concessions. Management has offered a raise of roughly 8% for teachers and paraprofessionals in the first year of a new contract, plus modest cost of living raises in the following three years—A proposal that would leave staff salaries well below compensation levels at CPS for the entire agreement. The strikers, who teach the same student cohorts as their peers in CPS-run schools, have asked for wage parity with their CPS colleagues. CICS executives were a no-show at a Friday legislative hearing convened by State Representative Sue Scherer (D-Decatur), chair of the House of Representatives’ Committee on Elementary & Secondary Education: Administration, Licensing & Charter Schools. The hearing was convened to gather information about charter management structures, a linchpin issue in the CICS strike. CICS has created a series of wholly owned subsidiaries called CMOs—charter management organizations—that, together with CICS itself, siphon off up to 30 percent of the public education dollars the schools receive to educate students. Both CICS and the CMOs that run their schools have dramatically increased their management fees in recent years. CICS’ 2018 audit shows that the fees charged to the four CTU schools by CICS and their subsidiary increased 25% in the last year. This jump in management fees took another $1.2 million out of the schools and classrooms. These fees feed a top-heavy and duplicate management structure and the cash hoarding that has undercut classroom resources. The number of six-figure staff at CICS increased from 4 to 14 since 2017. At CICS’ Civitas CMO, there are 10 chiefs and directors on staff to ‘supervise’ three schools. CICS has amassed a surplus of over $36 million from public dollars that it refuses to spend on classroom needs. $19 million has been invested in bonds through a firm run by the charter school operator’s co-founder and former president. It is those management and financial practices that prompted Scherer to convene Friday’s legislative hearing—and that is drawing increasing concern with public officials. 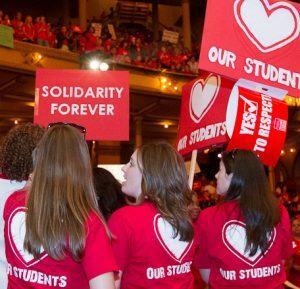 Saturday’s solidarity rally will kick off stepped up militancy on the picket line, with strikers unified around staying out until they win fair wages for workers and educational justice for students.